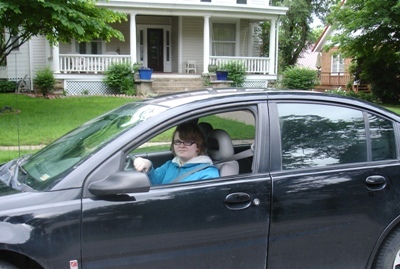 It’s hard to believe that our youngest daughter Leah is driving now. She has her learner’s permit and we are trying to get in all her hours of instruction for her to take her driver’s license test soon. Since Ray works so often during the day, I primarily have the role of “driving instructer,” a role I must admit that I am not real comfortable with…there is something about leaving my entire fate into the hands of a 16-year-old that unnerves me. Please understand, Leah is actually a good and careful driver. She doesn’t have the lead foot on the accelerator that our oldest daughter Heather had (still has!) or the distracted mindset of our very Sanguine middle daughter Eden, who loves to simultaneously chat and laugh, listen to music, pop gum, and modify your instructions to her own liking. But Leah does take right turns at the speed of light. Luckily, there haven’t been any cars or trucks in the opposite lane as she takes them, or our cute, black, Saturn Ion car that we bought last year would be flat as a frisbee by now. Today I decided that she needed practice with the right turns. As she turned right to go onto a road that is underneath a train bridge, a van approached us from the opposite direction. The road under the bridge is a small area, not allowing a two-car passage. I told Leah to stop, and then again – and then again LOUDER as she kept driving, turning the wheel, and she narrowly missed hitting the van. She later said she didn’t want to slam on the brakes which could cause an accident – but the point was that she needed to listen to the instructions. I think my blood pressure is still up from the stress. If I can get through teaching Leah to drive and her passing her driver’s test to get her license, I will be ok and can face anything in life. Like Leah learning to drive and needing to follow my directions to teach her to drive safely, it’s important that we listen to the “driving instructions” in God’s word to avoid “crashing” in this life. “Safety” is the main goal in driving; obedience and intimacy with God is our main goal in our relationship with Him. The best way to teach our kids, of course, is by our own good example.